Someone has made a Peter Pan cake! A friend saw this the other day on flickr and sent me the link… I love it! 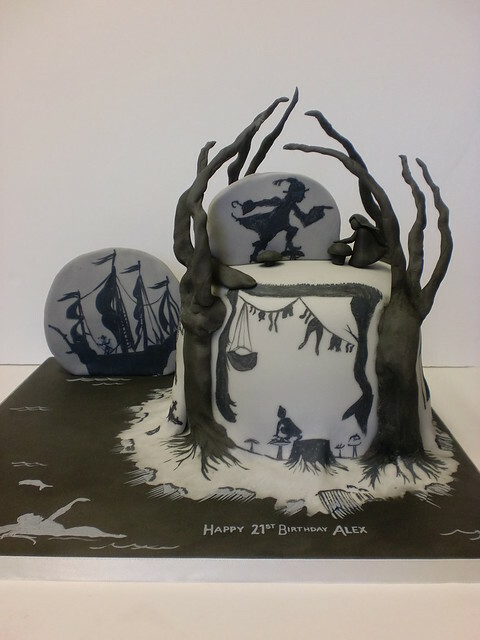 Someone has painstakingly recreated my Peter Pan wallpaper into edible 3D, painting and sculpting the scenes. I love the trees and the spooky little Wendy. I’m really delighted to have received funding from Arts Council England SW to develop my wallpaper and start to use digital media with my work. This means that this year i’ll be learning about animation and working on making a short film. Catherine Cartwright (my friend and fellow printmaker who i share a studio with) and i are hoping to find a way of collaborating and creating a piece of work together using our printmaking and NEW animation skills! Last week we ventured up to North Devon in the rain to draw and film these wet wolves. I wanted to work out how they move before attempting to animate them. I made my first Lotte Rieniger inspired shadow puppet too. i’ve also been in the workshop screenprinting work to exhibit in Present Makers – an exhibition of contemporary craft at Thelma Hulbert Gallery in Honiton this November. These are images of screenprinted stories onto painted mdf with metallic relief prints on using wallpaper and Honiton lace.